Signature lets you access a wealth of information from your Tokeet account through the use of data codes. Drag-and-drop fields from the data dictionary directly into the template. Position the fields perfectly to blend in seamlessly with the rest of the template. For contracts and documents, the data dictionary fields will allow you to display the associated data fields in the template when it is opened. These fields are only for display, and can not be altered in a contract nor document. For forms, the data dictionary allows for both data retrieval and display. 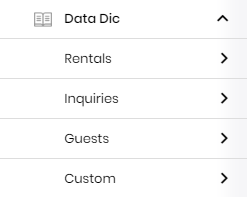 The fields under the Guests menu will allow the recipient of the form to enter new data that will overwrite the existing value in the Tokeet guest details. For example, if a form contains a guest name field, the recipient of the form will be able to modify the name of the guest on the associated inquiry. The fields under the Custom menu will allow the associated custom code to display in the opened template. You can utilize your own custom codes in your templates. Custom codes are created by clicking the Settings button, and selecting Custom Codes. Custom Codes are described in more detail here.